Positional vertigo a diagnosis that patients get when head position is an element in the onset of vertigo. 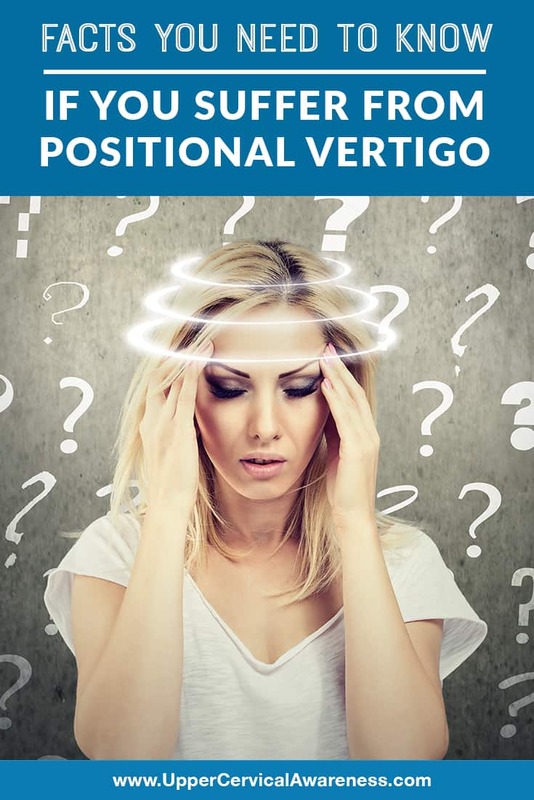 While positional vertigo is considered peripheral in nature (meaning that vertigo stems from a problem in the ear or vestibular nerve), less than half of people who get this diagnosis ever find out what the underlying cause of the problem is. If you are suffering from recurring bouts of vertigo, here are some things you need to know. You may find that vertigo is most likely to strike when you first wake up, before you even get out of bed. In many cases, vertigo doesn’t last long, and you can safely go about your day after waiting a minute or two for it to pass. If vertigo goes on for longer periods of time, your doctor may want you to get a hearing test to see if you are dealing with Meniere’s disease, a vestibular condition that can result in severe vertigo bouts, hearing loss, and ringing in the ears. Anywhere from 30-40% of people will develop vertigo at some time after they turn 40. However, that doesn’t make this a normal part of aging. Whether your doctor can find the underlying cause or not, something is causing your vertigo. While some people decide they can live with it, others are concerned about the potential for falls, or a vertigo bout occurring at a dangerous time (e.g., while driving). There are about 39 million people who get migraines in the US alone. As much as 40% of those individuals will experience vertigo as a symptom. However, not all doctors will associate vertigo with your headaches, and not all migraines have a headache as a symptom. Therefore, vertigo may be mistakenly diagnosed as positional. Other common symptoms of migraines include nausea and sensory sensitivities. Neck pain is one of the most common symptoms, with patients experiencing the pain either before or during the headache phase. When the problem is coming from both ears, vertigo and balance issues are usually worse. Meniere’s disease is one of the exceptions to this since it normally affects one ear only and results in severe vertigo bouts that can last for 20 minutes up to an entire day. While lifestyle changes are not a cure-all for vertigo, there are some things you can do at home to reduce how often this symptom springs up. Here are a few suggestions for taking care of vertigo at home. Drink more water – Vertigo is actually an early sign of dehydration. For some people, reducing the frequency of vertigo is simply about remembering to drink 8 full glasses of water per day. Dietary changes – When it comes to positional vertigo, the amount of fluid in the inner ear may lead to your symptoms. While it is important to know what is causing this fluid build-up, you may be able to reduce your symptoms in the meantime by changing up your diet to keep the body from making or retaining fluids. Reducing salt intake can stop the body from retaining as much fluid. Just be sure you are drinking enough so that you don’t start getting vertigo due to dehydration. Other things that are bad on fluid levels are refined sugars, artificial sweeteners, and anything you may have an allergy or sensitivity to. Reducing stress levels – Stress is a trigger for all sorts of health problems, and many vertigo-causing conditions are included. For example, migraines can occur when stress hormone levels quickly rise or fall within the body, so you can be on your way to vertigo and other symptoms both while you are stressed and when you finally get to relax. Positive stress coping mechanisms are a must because things like smoking and drinking to relieve stress can both make vertigo and other health problems worse. One possible cause of vertigo that is usually overlooked is an upper cervical misalignment. The atlas is the top bone in the neck. It balances the skull, protects the brainstem, and helps to facilitate blood flow to the head. Even a slight misalignment can throw of the central nervous system and many other key bodily functions. Vertigo is just one of the many things that can occur. If you are suffering from recurring bouts of vertigo and it turns out that you have an atlas misalignment, correcting this underlying issue may provide lasting relief. For example, in one vertigo case study, 80% of the patients were completely vertigo-free after having atlas misalignments corrected, and the other 20% of the participants in the case study also saw significant improvement. Upper cervical chiropractic is a natural and safe alternative for those who are seeking to avoid medications, surgeries, or injections for vertigo. While most people who have an atlas misalignment remember a head or neck trauma that could have caused the problem, this is not always the case, so be sure to have an upper cervical chiropractor examine your atlas to see if you are a good candidate for this form of care.